I’ve always thought of this as a visit to another planet. 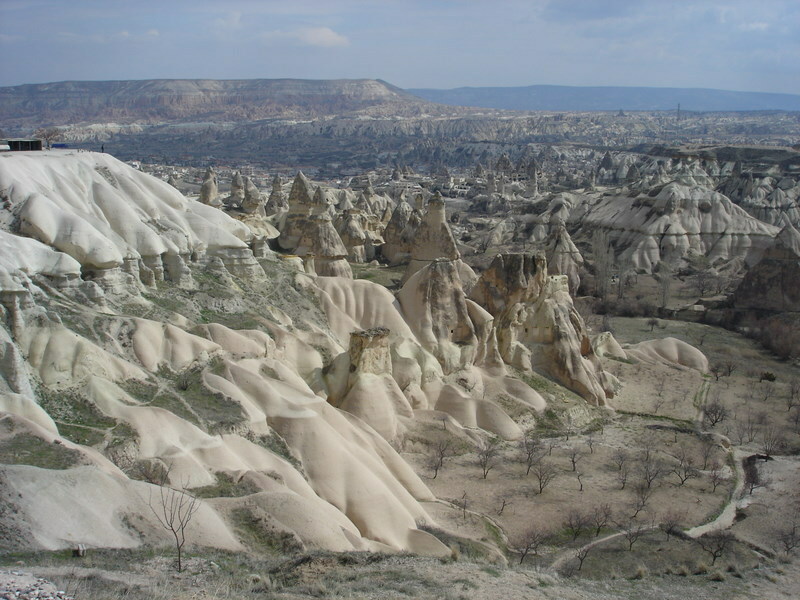 Cappadocia is the land of the “fairy chimneys.” Over the centuries erosion of the volcanic stone has created a landscape of cones, spires, and hard boulders balanced on the softer rock below. Located in central Turkey, this high-plain, semi-arid land seems out of a dream. Residents once built their homes into the rock and today you can still find a few homes and businesses, even hotels burrowed into the landscape like cavities in a mouthful of rotten teeth. Travelers have opportunities to explore these caverns in national parks such as the UNESCO-honored Göreme where you can find Christian cave churches. One in particular is the so-called “Dark Church.” Thanks to its lack of outside light, the Biblical-storied frescoes that cover the walls and ceiling are rich with color. The region dates back to the Bronze Age and was the homeland of the Hittites. Wrap your head around that for a moment. Persians, Romans, even Alexander the Great had hold of the area for a time, but under the Byzantines the Christians left the most visible marks of today as they gradually emerged from hiding. Not just homes, but whole cities went underground. Özkonak is a network of underground chambers where the population once reached 60,000. Ventilation shafts and storage space meant the lot of them could survive a siege locked in by stone barriers for up to 3 months. Uçhisar goes the other direction; it is a massive rock outcrop carved into a honeycomb fortress towering over the plains. In Cappadocia, you’ll still find the cheesy pose-with-a-camel opportunities by the roadside, but if there is one touristy attraction you should give in to, it would be a balloon ride over the peculiar terrain. Watch the sun rise over Cappadocia as you drift silently over the land and get photos the bus-bound won’t ever see. Besides exploring the landscape, you can visit local carpet manufacturers for demonstrations. The prices should be less than in Istanbul. (Haggle like a pro.) Bring a bottle of the local sweet wine back to your hotel. Finally, pottery is another local product. Head for the town of Avanos and try your hand at it during a visit to a pottery maker’s shop. This is a good place to find one of the traditional Hittite sun image wine pitchers. If you want to stay in a rock hotel, shop around in Ürgüp. 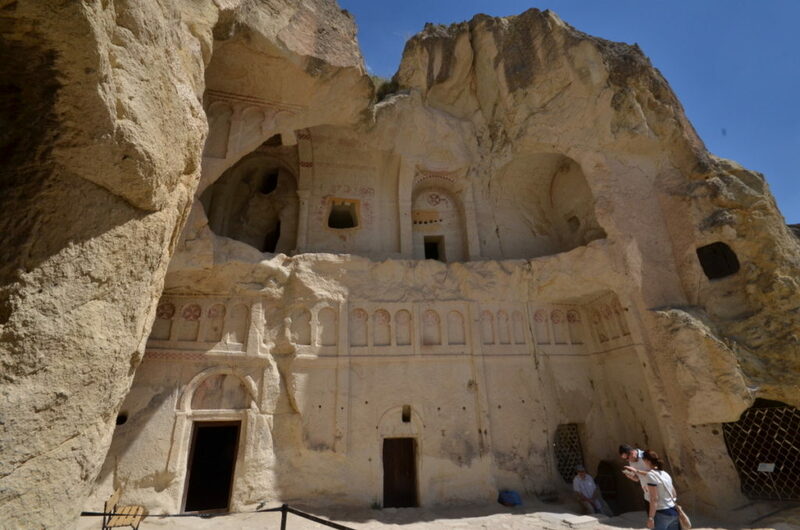 Personally, I adored Kelebek Pansiyon in Göreme and spent the night in what was once a small chapel. Flying from Istanbul is a snap and there are many airlines running routes to the regional airport at Kayseri. It’s hard to believe this was once a seaside port, being that you can’t even see the sea from here. The ruins are unbelievable. 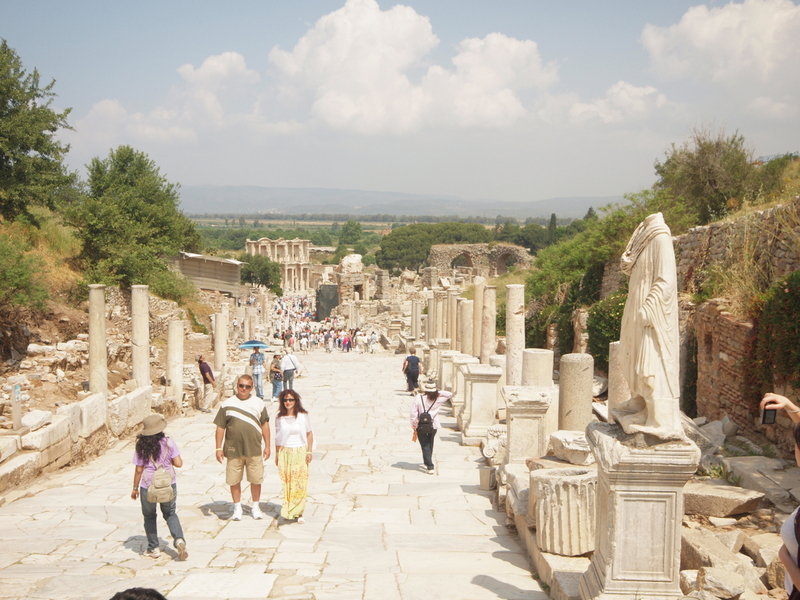 Settled as far back as 6000 BC during the Neolithic Period, Efes has history literally on top of history. You are walking across the same stone streets once tread by Ancient Greeks several hundred years BC and later by the Romans. At one point, a quarter of a million people milled among these stone walls so close your eyes and imagine those hordes of tourists are just typical of city life back in the day. 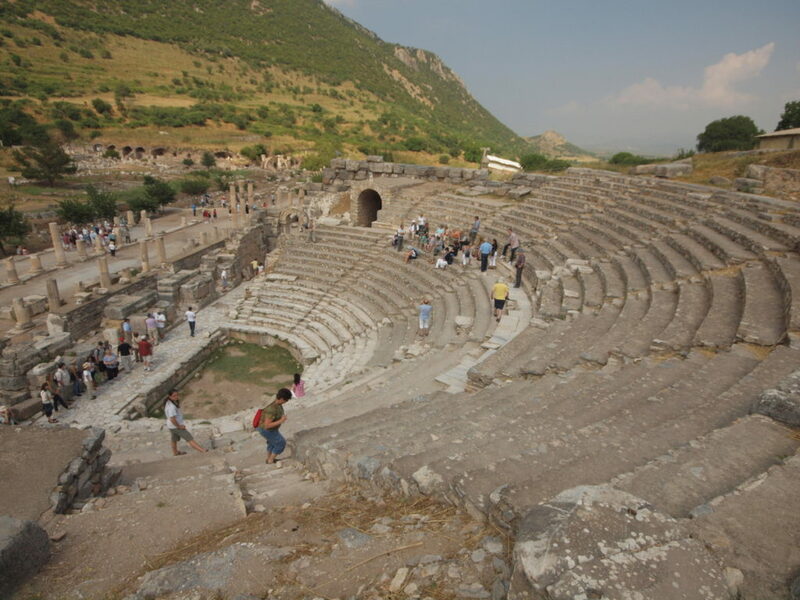 The amphitheater built into a mountainside is intact, and Biblical tourists can look down on the stage to conjure an image of St. Paul preaching to the populace. (Letters to the Ephesians, right?) Others come perhaps to see an occasional modern concert. Sting has performed here. The façade of the library is the most impressive of the remains, and as you wander the city you can see everything from temple to toilet. If you have a guide (recommended), take note of the imprint on the walk which indicates where the local brothel once stood (perhaps not a prominent item on the Biblical tour). Excavations are on-going; a good guide can show you the gladiator graveyard nearby which has revealed much about the performers’ lifestyles and the special treatment they actually received. While the ruins of Troy are also in Turkey, Efes wins if you have to choose. Troy requires more imagination and a deeper interest in archaeology. Next to Efes is the town of Selcuk where you can see the Temple of Artemis, the very basic remains (in fact, just one reconstructed column!) of what was once one of the Seven Wonders of the Ancient World. 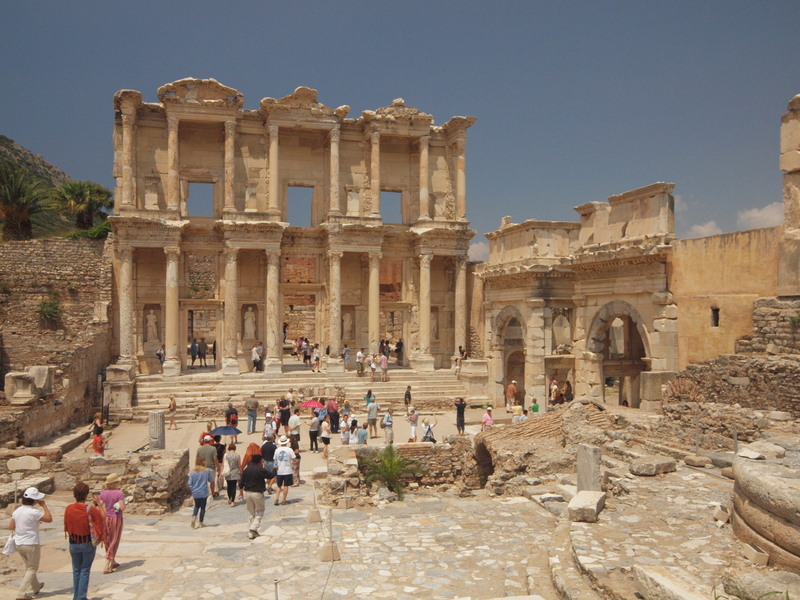 Get your photo and explore the ruins of the Basilica of St. John but be sure to stop in at the Ephesus Museum for an impressive collection of area artifacts and a better idea of what made this area so special. The beach isn’t far away in tourist town Kusadasi and the final home of the Virgin Mary is a must-stop for pilgrims. Also in the area are leather manufacturers, carpet makers, and Sirince, an out-of-the-way mountain village gaining notoriety for its local wines and quaint appearance. Many airlines, including budget operations, fly to Izmir. Then you must take a bus, minivan, taxi or tour to get the last 80 km to Kusadasi. Airlines include Turkish Airlines, Onur Air, Pegasus Airlines and Atlasjet. Staying in Kusadasi is best. Sun Express offers flights from Izmir to Kayseri (Cappadocia) so you could make a nice little circle of Efes and Cappadocia with a return to Istanbul. Hands down one of the best online resources for Turkey travel is Turkey Travel Planner , a website run by Tom Brosnahan, a long-time guidebook author and expert on Turkey. Kevin Revolinski lived in Anakara, Turkey and is the author of The Yogurt Man Cometh: Tales of an American Teacher in Turkey which has been translated into Turkish and Korean, and is now in its fourth printing. Check out Kevin Revolinski’s contributor page for more of his exciting travel stories. 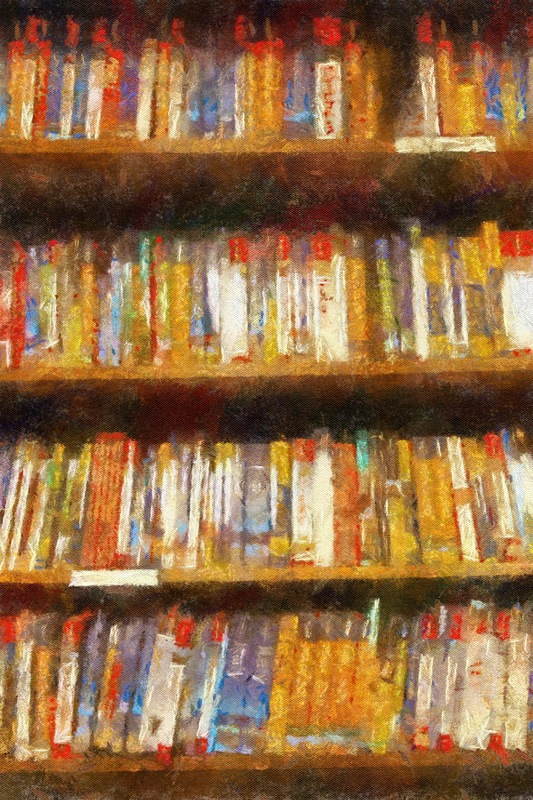 Follow Kevin Revolinski’s travels on his travel-planning website, The Mad Traveler, featuring many of his articles, photographs, information about his published travel guides, and more.